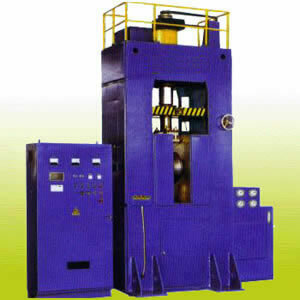 YTD72P series rare earth magnet hydraulic press uses the PLC control technology to ensure safe and simple operation. Its hydraulic transmission and its union type of drive guarantees the repetition pointing accuracy for material density and high uniformity. Its sealing system is available according to user's request. The rare earth magnet hydraulic press has a permanent bidirectional hydraulic pressing system. It has a simple structure mold with a convenience replacement and it has an advanced silicon-controlled rectifier. It can have vertical or horizontal magnetic field orientation. It has a copper pipe water cooling system making its work continuous and steady. Additionally, the rare earth magnet hydraulic press has output voltage 0-500V and it has protection against electric current fluctuation.